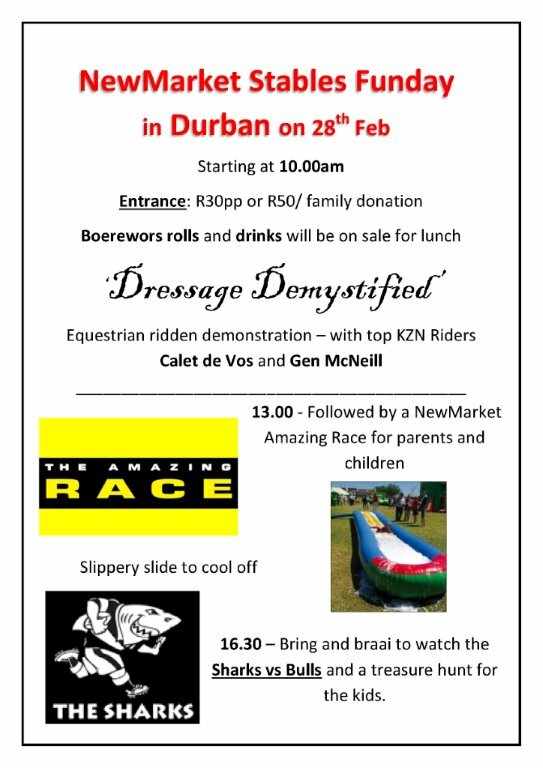 Join us on the 28th of Feb 2015 for an activity filled day including a ridden equestrian demonstration by top KZN riders, a family Amazing Race, jumping castle, slippery slide, treasure hunt and a bring and braai while watching the Sharks take on the Bulls. Newmarket Stables is holding a holiday fun camp! Lots of fun activities for the kids, and a whole day spent playing and learning with horses. For more information please download the file below and contact Nadine Parker. Unaffiliated training dressage show held by KZNHS dressage judge Nadine Parker at Newmarket stables. All are welcome. Stabling available for people wishing to stay for the jumping on Sunday! Jumping training show at the cycle stadium next to Newmarket stables. Crosses, 40cm, 50cm, 60cm, 70cm, 80cm, 90cm, 1m - !! ALL ARE WELCOME !! Entry forms in the office or can be downloaded off our news page. Come down to the stables for a fun family day!! Newmarket is holding a family fun day and show to bring about awareness for all the kids and parents about the Pony Club. In the morning there will be a Jumpkhana, bending poles race AND a fancy dress. This is to be followed by a bring and braai which everyone is welcome and encouraged to stay for. All parents are encouraged to stay in able to be informed about the pony club and interbranch, while the kids will be kept entertained with an exciting treasure hunt!! Jumping training show at Newmarket Stables on the 26 February! Entry forms in the office or can be downloaded from our news page! October Show Jumping Training Show!! Entry forms can be found in the office or can be emailed to you. For further information please contact the office. Attention all members and riders of the yard. Our cross country course is in desperate need of a little TLC so as Thursday 16 June is a public holiday the yard is calling on ALL riders to pitch in and help build jumps for the cross country show happening soon! We all benefit in new jumps being built so everyone please come down on Thursday and help out. If anyone has any spare paint lying around please don't hesitate to bring it! !